They say that in London everyone lives within 6 feet of a rat. Denizens of the night, these rats are presumably dozing the day away somewhere beneath the floorboards, or in the drains. Or perhaps you're reading this in bed, in which case they may be having a riot in the kitchen (in the house next door). Perhaps a few are decomposing in the drains too, as rats don't live much longer than three years. Once feared as carriers of the black plague, rats still symbolize squalor and filth, but we are also indebted to them: in the laboratory, their clean-living cousins have helped rewrite the medical texts, serving as models of human diseases and (in that archaic turn of phrase) as guinea pigs for many new treatments. Rats are useful laboratory animals because they are like us in many ways—they, too, are mammals, with the same organs, the same layout and basic functionality, the same senses, even sensibilities—they share a lively curiosity about their surroundings. Rats, too, suffer from the equivalent diseases of old age—cancer, atherosclerosis, diabetes, cataracts, and so on, but offer the tremendous advantage that we don't need to wait for seventy years to see whether a therapy is working—they suffer from such senile diseases within a couple of years. Like us, they are prone to overeat when bored, easily becoming obese. Anyone who owns a pet rat (commonly the researchers who work with them) knows they must guard against overfeeding and boredom. Hiding the raisins is a good idea. We're so close to rats (in every sense) that it might come as a shock to appreciate how much faster their organs must work than ours: their heart, lungs, liver, kidneys, intestines (but not the skeletal muscle) must work on average seven times harder than ours. Let me specify what I mean by this. Let a modern-day Shylock take one gram of flesh from a rat, and another from a human being—perhaps a bit of liver. Both bits of liver contain roughly the same number of cells, which are about the same size in rats and humans. 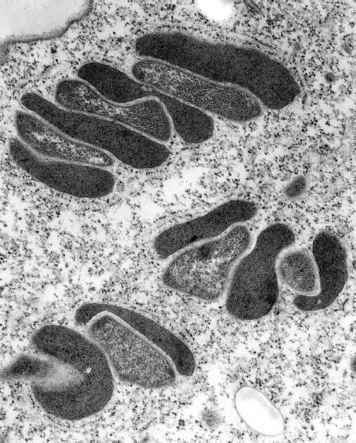 If we can keep the tissue alive for a while, and measure its activity, we'll see that the gram of rat liver consumes seven times as much oxygen and nutrients per minute as its human counterpart—even though we could hardly tell which piece was which down the microscope. I should stress that this is purely an empirical finding; why it happens is the subject of this chapter. Even though the reasons behind this striking difference in metabolic rate are obscure, the consequences are certainly important. Because the cells in a rat and a human being are of a similar size, each individual rat cell must work seven times harder (nearly as fast as Haldane's geometrically challenged worm). The repercussions permeate all aspects of biology: each cell must copy its genes seven times faster, make seven times as many new proteins, pump seven times as much salt out of the cell, dispose of seven times as many dietary toxins, and so on. To sustain this rapid metabolism, the rat as a whole must eat seven times as much food relative to its size. Forget the appetite of a horse. If we had the appetite of a rat, instead of feeling full after a 12 ounce steak, we'd want to eat a five pounder! These are fundamental mathematical relationships, which have nothing to do with genes (or at least nothing directly), and go part way to explaining why rats live for three years, while we live out our three score years and ten. Rats and humans sit on an extraordinary curve, which connects shrews, one of the smallest mammals, with elephants and even blue whales, the largest (see Figure 12). Large animals clearly consume more food and oxygen than small animals. However, given a doubling in mass, oxygen consumption does not rise by as much as one might predict. If the mass is doubled, so is the total number of cells. If each cell needs the same amount of energy to stay alive, then doubling the mass ought to double the quantity of food and oxygen required. This assumes an exact equivalence: for every rise in mass, there is an equivalent rise in metabolic rate. Yet this is not actually what happens. As animals become larger, their cells need fewer nutrients to stay alive. Effectively, large animals have a rather slower metabolic rate than they 'should' have. For every step in mass, there is a smaller step up in metabolic rate. We have seen there is a sevenfold difference between a rat and a man. The larger the animal gets, the less it needs to eat per gram weight. In the case of the elephant and the mouse, for example, if we work out the quantity of food needed to sustain each cell (or per gram weight), the elephant requires 20 times less food and oxygen every minute. Put the other way around, an elephant-sized pile of mice would consume 20 times more food and oxygen every minute than the elephant does itself. Clearly it's cost-effective to be an elephant; but can the cost savings of greater size explain the tendency of organisms to grow larger and more complex over evolution? Metabolic rate is defined as the consumption of oxygen and nutrients. If the metabolic rate falls, then each cell consumes less food and oxygen. And if all the cells in the body consume less oxygen, then the breathing rate, heartbeat, and so forth, can all afford to slow down. This is why the heartbeat of an elephant is ponderous in comparison to the fluttering beat of a mouse—the individual cells of an elephant need less fuel and oxygen, so the elephant's heart doesn't need to beat as vigorously to provide them (this assumes that the heart is the same size, relative to the overall size of the animal). Another unexpected consequence is that the rate of ageing slows down. Mice live for 2 or 3 years, and elephants for about 60, yet both have a similar number of heartbeats in their lifetime, and over their lives their component cells consume around about the same quantity of oxygen and food (the elephant in 60 years, the mouse in 3). The cells seem able to burn a fixed amount of energy, but the elephant burns its quota more slowly than the mouse (its cells have a slower metabolic rate), and it does so, apparently, just because it is bigger. Such relationships have a profound effect on ecology and evolution. The size of animals influences their population density, the range of distances they travel in a day, the number of offspring, the time to reproductive maturity, the speed of population turnover, and the rate of evolution, such as the origin of new species. All of these traits can be predicted, with startling accuracy, from nothing more than the metabolic rate of individual animals. Why metabolic rate should vary with size has perplexed biologists, and indeed physicists and mathematicians, for well over a century. The first person to study the relationship systematically was the German physiologist Max Rubner. In 1883, Rubner plotted the metabolic rates of 7 dogs, ranging in weight from 3.2 to 31.2 kilograms. The raw data trace a curve, but if instead the data are plotted out as a log-log plot, they fit a straight line. There are various reasons for using a log plot, but the most important is that this allows the multiplication factor to be seen clearly: instead of adding steps at a fixed distance along an axis (10 + 10 + 10, and so on), a log graph multiplies them (10 X 10 X 10, and so on). This shows how many multiplications of a parameter correspond to multiplications of another. Consider a simple cube. If we plot log surface area on one axis, and log volume on another, we can plot out how they change relative to one another as the size of the cube is increased. For every tenfold increase in the width of the cube, we see a 100-fold increase in the cube's surface area, and a 1000-fold increase in volume. On a log-log plot, an increase in surface area of 100-fold corresponds to two steps, and the increase in volume to three steps. This gives the slope of the line. In the case of the cube, the slope is 2/3, or 0.67— for every two steps in surface area there are three steps in volume. The slope of the line connecting the points is the exponent, which is usually written as a superscript after the number it applies to, so in this case the exponent would be written as 2/3. By definition, an exponent denotes how many times a number should be multiplied by itself (so 22 = 2 X 2, while 24 = 2 X 2 X 2 X 2) but when dealing with fractional exponents, like 2/3, it's much easier to think in terms of the slope of a line on a log-log graph. If the exponent is 1, this means that for every step along one axis, there is an equal step along the other axis: the two parameters are directly proportional. If the exponent is V, this means that for every step along one axis, there are four steps along the other: there is a consistent but disproportionate relationship. Let's return to Max Rubner. When plotting log metabolic rate against log mass, Rubner discovered that the metabolic rate was proportional to the mass with an exponent of 2/3. In other words, for every two steps in log metabolic rate there were three steps in log mass. This is of course exactly the same as the relationship between the surface area and the volume of a cube, which we just discussed. For his dogs, Rubner explained the relationship in terms of heat loss. The amount of heat generated by metabolism depends on the number of cells, whereas the rate at which the heat is lost to the surroundings depends on the surface area (just as the amount of heat emitted by a radiator depends on its surface area). As animals get larger, their mass rises faster than their surface area. If all the cells continued to generate heat at the same rate, the overall rate of heat production would rise with body mass, but heat loss would depend on the surface area. Larger animals would retain more heat. If all the cells of an elephant generated heat at the same rate as those of a mouse, it would melt— literally. More constructively, if the point of a fast metabolic rate is to keep warm, and large animals retain heat better, then there is less need for an elephant to have a fast metabolic rate: it is as fast as it needs to be to maintain a stable body temperature of about 37°C. Thus, as animals increase in size their metabolic rate slows down by a factor that corresponds to the ratio of surface area to mass. 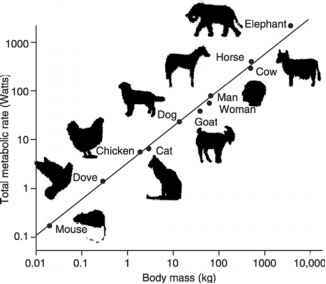 12 Graph showing the scaling of resting metabolic rate with body mass across mammals of widely differing mass, from mouse to elephant. The slope of the line on a log-log plot is %, or 0.75, which is to say that the line rises 3 steps up the vertical axis in the space of 4 steps on the horizontal axis. This slope gives the exponent. The metabolic rate is said to vary with the three-quarter power of mass, or mass3/4. Why on earth metabolic rate should vary with the 3/4 power of mass remained a mystery for another half century; and indeed the glimmerings of an answer are only now beginning to materialize, as we shall see. But one point was patent: while a 2/3 exponent, connecting the metabolic rate with the surface area to volume ratio, made sense for warm-blooded mammals and birds, there was no obvious reason why it should apply to cold-blooded animals, such as reptiles and insects: they don't generate heat internally (or at least not much), so the balance of heat generation and heat loss could hardly be the dominating factor. From this perspective a 3/4 exponent made as much, and as little, sense as a 2/3 exponent. But while various attempts have been made to rationalize the 3/4 exponent, none ever really convinced the whole field. 1 How do we reconcile Max Rubner's exponent of 2/3 with Max Kleiber's 3/4? The usual answer is that within species the metabolic rate does indeed vary with 2/3, and the 3/4 exponent only becomes apparent when we compare different species. Laboratory, Geoffrey West, joined forces with the ecologists James Brown and Brian Enquist, at the University of New Mexico, Albuquerque (through the Santa Fe Institute, an organization that fosters cross-disciplinary collaborations). They came up with a radical explanation based on the fractal geometry of branching supply networks, such as the circulatory system of mammals, the respiratory tubes of insects (the trachea), and the plant vascular system. Their densely mathematical model was published in Science in 1997, and the ramifications (if not the maths) swiftly captured the imagination of many. How many times faster( or slower) is the metabolic rate of ONE CELL of a mouse (? Why metabolic rate of elephant is slower than a mouse?